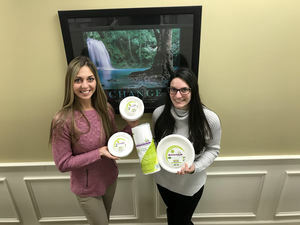 SYOSSET, N.Y., Jan. 30 /CSRwire/ - Servomation and Emerald Brand have announced a partnership to deliver Emerald’s sustainable food service program to their customers throughout New York, Connecticut and Massachusetts. Servomation, headquartered in Canastota, NY, services business and industries including manufacturing, banking, insurance, hospitals and public access locations. Their customer base currently consists of over 300 self-service E-Z Markets and over 1,750 vending customer locations. Servomation is now delivering a cost-effective solution in sustainability from food packaging, to disposables and cleaners to new and existing clients. Emerald Brand has assisted Servomation in converting to a uniform, streamlined solution without making it cost-prohibitive. Servomation will be offering its customers a broad range of Emerald Brand products including Tree-Free™ plates, bowls, bath tissue, and napkins, bio-plastic foodservice disposables, environmental garbage liners, and more. The Emerald Sustainability Program allows companies to accomplish their social responsibility initiatives while measuring their environmental savings in a palpable way. It provides companies with quarterly Environmental Impact Statements that calculate the amount of landfill waste diverted and the number of trees, virgin fiber, water and plastic saved through use of Emerald products. Servomation’s clients will now also have access to Emerald Brand’s marketing, communication and environmental consulting teams. Family owned and operated since 1997, Emerald Brand is committed to innovating through tree-free, sustainable and rapidly renewable solutions. From Tree-Free paper products to petroleum-free cutlery and a suite of over 250 sustainable corporate solutions, Emerald Brand is at the forefront of driving sustainability in homes and offices around the world. Emerald Brand products are available for consumer purchase at www.emeraldbrand.com and for businesses at www.paradigm-grp.com. Emerald Ecovations, a division of Emerald Brand, educates customers on the practice and implementation for consumable packaging and chemicals, and offers a suite of sustainable corporate solutions that help businesses adhere to new regulations and environmental mandates. Servomation Refreshments, Inc. is the Northeast’s leader in vending and office refreshments. Founded in 2007, Servomation has established a reputation for their commitment to excellence, uncompromising product quality standards, and utilization of the latest vending technology. Their team of professionals are dedicated to challenging the boundaries of innovation while continuing to foster strong customer relationships and a solid sustainable growth plan.